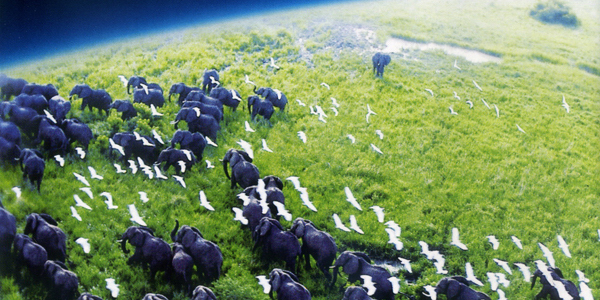 Early 2006 brought the world the first high-definition nature documentary series, and one of the most expensive. Ten years later, wildlife enthusiasts were given a sequel: Planet Earth II. Substance aside, for now, one of the most captivating aspects was the change of cinematographic technology in ten years, now featuring animals in a stunningly crisp 4K high-def resolution and shooting intimately close shots never seen before of animals across, above, and underneath our landscapes. We act on things we care about. At a time when science is under direct and constant assault—from snowball appearances in the Capitol to a slew of anti-environment legislation lined up for the upcoming Congressional session—we need to capture the populace’s attention like never before. And BBC’s Planet Earth series is doing the exact sort of work we need. If the government isn’t going to use science to influence public policy and excite the masses, we need to educate and inspire on its behalf. When Cosmos was released in 1980 starring astrophysicist Carl Sagan, it was the most widely watched series in the history of American public television for an entire decade. What Dr. Sagan was able to do was show the world the beauty of galaxies far away and explain their significance in a way audiences found gripping right in their own living rooms. In an homage to the series, our own generation’s science superstar and astrophysicist Dr. Neil deGrasse Tyson resurrected the series, once again reminding the world to dream big. What science needs now is eloquent, clear, and compelling presentation in order to stimulate considerate, compassionate, and reasonable practices in life and in public policy. And the best way to do that is to elevate science and the dialogue surrounding it, not have it stonewalled by baseless skepticism for the sake of skepticism. Planet Earth II shows us niches around the world, featuring everything from islands to mountains to jungles to deserts to grasslands to cities. We see the lives of numerous species up close and personal, and the environments they inhabit. And more importantly, how each and every one has been drastically affected by human-driven climate change. What well-meaning and humble people of all political ideologies have to do is listen to those who know more than them on topics that escape their expertise. The carpenter might have a better understanding of woodwork, and we ought to admit that. The climatologist might have a better idea of human increased production of carbon dioxide and its effects on the environment, and we ought to listen to them. The gynecologist and the woman with an unwanted pregnancy may have a better understanding of reproductive health and justice than the septuagenarian curmudgeon lawmaker on Capitol Hill, and we ought to listen to the former two in making their personal decisions. Before rushing to believe ourselves experts on everything, we ought to adopt the humility of scientists. The biologist feels no shame in saying that something is not their field of expertise and redirecting a question to a chemist. The physicist has no issue relaying a question on neural circuitry to the neuroscientist to field instead. This is not a sign of weakness; it is a sign of maturity and a lack of insecurity about ignorance. What BBC’s Planet Earth II has tried—and arguably succeeded in doing—is recreating the sense of childhood wonderment and awe that leaves us baffled and amazed in learning about things through vivid photography and compelling narratives. It forces us out of our lives, out of the cacophonous whirlwind of political disaster and social chaos into the hands of nature to observe and to learn, hopefully inspiring us to bring about change. To become a part of the resistance against destruction. To aid in the fight for wildlife preservation and knowledge. And to utilize the latest in science and technology as a means to identify with our evolutionary history and our extended biological family.